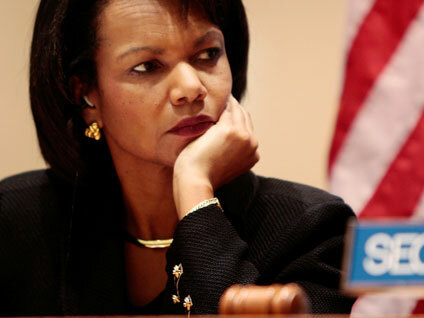 Former Secretary of State Condoleezza Rice suggested giving Palestinian refugees land in South America as an alternative to letting them return to their former homes in Israel and occupied territories, according to a report from the British newspaper the Guardian. Rice made the comments at a meeting in June 2008 with American, Israeli and Palestinian negotiators in Berlin, according to minutes shown to the Guardian. "Maybe we will be able to find countries that can contribute in kind. Chile, Argentina, etc (ie, give land)," Rice said, according to the minutes. The minutes are not verbatim, but have the initials CR before the quote. Rice was the only one there with those initials. Chile has a large Palestinian community that dates back more than a century, the Guardian reports. Both Chile and Argentina have large tracts of sparsely populated land. In the spring of 2008, 117 Palestinian refugees were transferred to Chile, a few months before the Berlin meeting. The group of refugees had lived in Iraq for several years, but were in a camp along the Syrian border following the ouster of Saddam Hussein. Chile accepted the group after a U.N. appeal.